After 4 years as a single man living abroad, I finally married a really great young lady. There's a catch though... she is not Korean, nor did we meet in Korea, though we did meet through a common connection in Korea (more to come on that later). Time for my business school colleagues to settle their side bets on whether or not I would get married here! When I left the US in 2012 I told my friends that I expected personal considerations, not the work, would dictate the amount of time I stayed in Korea. Turns out this was prescient. Maybe I anticipated I would meet a Korean woman but that's just not how things worked! 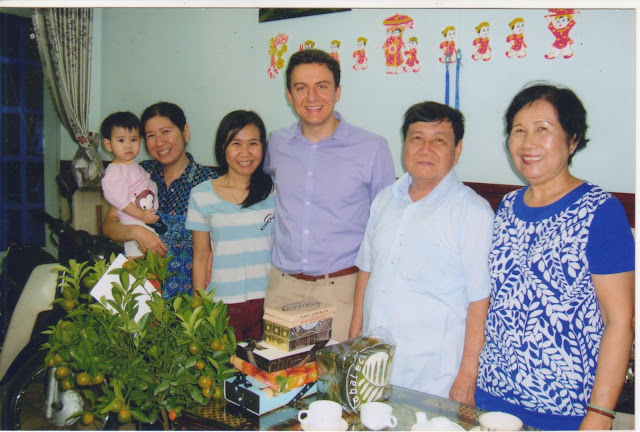 I met Xuanhoa (pronounced "soon hwa") on my first trip to Vietnam in January 2014 when I was visiting a Samsung Vietnam manager who I had met on a Buddhist temple stay at Hwaeomsa in spring 2013. On my first day in Ho Chi Minh City my acquaintance and I met for lunch — I was also staying at her house at the time — and because my acquaintance was busy with work that afternoon she had one of her staff members show me around a few places in the city. That staff member, who introduced herself as "Meg", and I hit it off and later in my trip we shared a couple dates together. We said goodbye at the airport in Ho Chi Minh City and I returned to my life in Korea. Four months later in May 2014 Xuanhoa made her first trip to South Korea. I showed her around Seoul and we visited Jeju Island together. After Xuanhoa returned to Vietnam we agreed to begin our "relationship" and the rest is history. 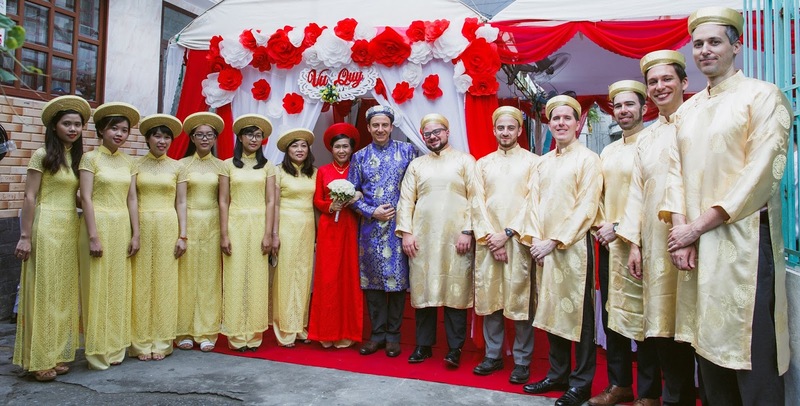 After two grueling years of long-distance courtship — including 14 more trips for me to Vietnam, 3 more trips for her to Korea, 2 trips for us to the USA, and meet-ups in Cambodia, Thailand, Taiwan, Singapore, Philippines — we finally were married last month in a beautiful ceremony at a Buddhist pagoda in Ho Chi Minh City. I was elated to have all of my immediate family there and many of my friends from my Korean adventure were there as well. We were also elated to be done with wedding planning since this had been a yearlong project since I proposed in December. But the best part for us, of course, has been finally living together in the same place. Xuanhoa moved into my apartment in late July and she's a registered "alien" living in Korea now. No more Skype phone calls on shaky internet connections! No more "when will I see you again" and no more sad red-eye flights back to Korea after leaving Xuanhoa in Vietnam yet again. 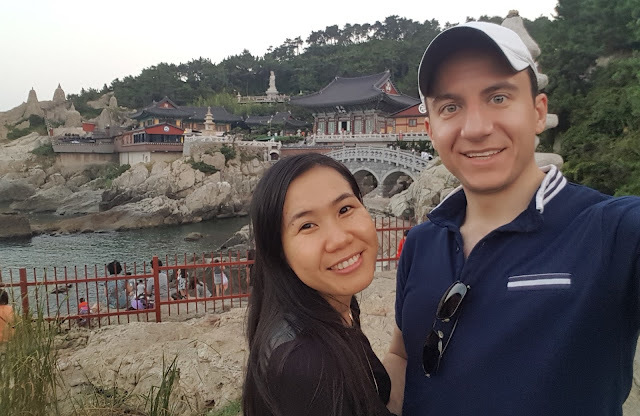 Except ... for this weekend ... Xuanhoa returned to Vietnam for a few days to tidy up some affairs at home and I am able to reflect on how my life has changed with her here. For one thing, I am a very spoiled husband. Xuanhoa is a delightful cook, she enjoys whipping together breakfast and dinner for me every day. Also she is super excited to have a proper oven for the first time in her life and I am giddily asked almost every day to try some new baked good that she concocted. The Samsung cafeteria misses me now! (you can eat 3 meals a day there) Xuanhoa loves making things organized and my house has never been tidier. As Xuanhoa is a housewife for now (hopefully temporary), I am always greeted with a big smile when I come home from a long day at work. Also, watching Xuanhoa go through the difficulty of moving to Korea as a foreigner makes me reflect on my own first weeks in Seoul 4 years ago. At first Xuanhoa was fascinated by new Korean foods. She developed a kimbap obsession until one day her stomach turned and she realized that kimchi was upsetting her stomach. Xuanhoa had several confusing, mysterious foreigner experiences at the immigration office and at a health clinic which didn't speak any English for a tuberculosis check (even though it was a test center "designated" for foreigners). Xuanhoa has learned the subway system (relatively easy) and how to take a bus (not easy for a first-timer), and got lost while trying to find me in Gangnam one evening. Without a motorbike Xuanhoa is walking much more frequently now and her legs have been getting tired. Xuanhoa is always asking me where to find this thing or that and sometimes I frustrated how even after 4 years in Korea I don't have many of the answers for her, language barriers between me and Korean still being what they are. At least Xuanhoa is not stuck in a temporary extended-stay hotel by herself, as I was, and fortunately I live close to several foreign food markets where we can eventually find most, but not all, of the special ingredients that she is looking for in her special recipes. Xuanhoa will start studying Korean soon so she can at least master the basics to survive here (as I have), and I am trying to help her build a social network here. These growing pains aren't easy to overcome, but it's very good to have each other every day. And last weekend I was able to show Xuanhoa a new place in Korea — Busan! It was a 3-day holiday weekend and Busan was super crowded ... and sizzling HOT. Xuanhoa didn't want to do too much sightseeing in the heat but she really enjoyed the Haedong Yonggungsa Temple along the coastline and the Nurimaru APEC house near Haeundae Beach. Xuanhoa is eager to visit the DMZ and the mountains in Gangwon province this fall. As for me, I am delighted that serendipity has brought a wonderful lady into my life and that I can share myself with her. I will never quite have my freedom again like before, but I will happily trade that for avoiding lonely nights at home when there is no food in the fridge and I don't know what I will eat for dinner ... sort of like this evening! Honey, come back soon!